About this Maxson Softshell Jacket by TRIMARK - Mens:The Maxson is designed for movement while providing protection from the elements.Available in a range of great colors, the Maxson features waterproof, breathable three-layer construction, as well as ergonomic sleeves and articulated elbows for a superior fit – and the womens style includes shaped seams, a tapered waist and a dropped back hem for an even more natural fit.OUTERSHELL:100% Polyester mechanical stretch woven bonded to 100% Polyester anti-pill microfleece with waterproof (8000mm), breathable (400g/m²) membrane and water repellent finish. 270 g/m² (8 oz/yd²) LINING:100% Polyester brushed tricot knit. About this M - OKAPI KNIT JACKET:This 100% polyester jersey knit jacket has a brushed back detail and is equipped with mesh pocket bags.The Okapi’s versatility and 4 color options makes it a great choice for university and team jackets or everyday wear. About this Tyndall Polyfleece Vest by TRIMARK - Mens:The Tyndall is a perfect complement to a long sleeve woven when the temperature starts to dip.Made with 100% polyester anti-pill microfleece, it features contrast binding around the armholes that matches the full center zipper.The Tyndall also includes design details like easy grip zipper pulls and a contrast hanger loop inside the neck, and the womens style has a dropped back hem, shaped seams and tapered waist for a more natural fit.100% Polyester anti-pill microfleece. 180 g,m2 (5.3 oz/linear yd). About this W - OKAPI KNIT JACKET:This 100% polyester jersey knit jacket has a brushed back detail and is equipped with mesh pocket bags.The Okapi’s versatility and 4 color options makes it a great choice for university and team jackets or everyday wear. About this Rixford Polyfleece Jacket by TRIMARK - Womens:The comfortable Rixford offers a classic look for chilly weather.Made with 100% polyester anti-pill microfleece, it features an interior thumb grab at the end of each sleeve and a contrast hanger loop inside the neck.Thoughtful details like easy grip zipper pulls add to the Rixfords retail feel, and the womens style has a dropped back hem, shaped seams and tapered waist for a more natural fit.Available in colors ranging from Forest Green and Olympic Blue to basic Black, the versatile Rixford is a stylish look for any brand. About this Karula Lightweight Jacket by TRIMARK - Mens:With a roll-away hood that packs neatly into the collar, the versatile Karula Lightweight Jacket offers two very different looks.Its comfortable too; providing water and wind resistance for inclement conditions along with articulated elbows, ergonomic sleeves and adjustable cuff tabs for a great fit in any weather.Featuring reflective detail, interior contrast color pops and an exterior zipper flap that provides a unique decoration location, the stylish Karula is designed to turn heads.Fabric OUTERSHELL:100% Polyester dobby 300T with water resistant coating (600mm) and water repellent finish.84 g, m2 (2.5 oz, yd2) LINING:100% Polyester mesh body and pocket bags. About this Maxson Softshell Jacket by TRIMARK - Womens:The Maxson is designed for movement while providing protection from the elements.Available in a range of great colors, the Maxson features waterproof, breathable three-layer construction, as well as ergonomic sleeves and articulated elbows for a superior fit – and the womens style includes shaped seams, a tapered waist and a dropped back hem for an even more natural fit.The Maxson also features a polyester brushed tricot upper storm flap, easy grip zipper pull and adjustable cuff tabs with hook and loop closure.OUTERSHELL:100% Polyester mechanical stretch woven bonded to 100% Polyester anti-pill microfleece with waterproof (8000mm), breathable (400g/m²) membrane and water repellent finish. 270 g/m² (8 oz/yd²) LINING:100% Polyester brushed tricot knit. About this Rixford Polyfleece Jacket by TRIMARK - Mens:The comfortable Rixford offers a classic look for chilly weather.Made with 100% polyester anti-pill microfleece, it features an interior thumb grab at the end of each sleeve and a contrast hanger loop inside the neck.Thoughtful details like easy grip zipper pulls add to the Rixfords retail feel, and the womens style has a dropped back hem, shaped seams and tapered waist for a more natural fit.Available in colors ranging from Forest Green and Olympic Blue to basic Black, the versatile Rixford is a stylish look for any brand. About this M - CIMA KNIT JACKET:The Cima is a sporty lightweight style that features plenty of thoughtful details.Along with easy grip zipper pulls and thumb exits in the sleeve cuffs, the Cimas grey upper zipper placket offers a unique location for high-impact decoration.Its also got an interior media exit port with cord guide, a dropped back hem, and eye-catching contrast zippers and stitching.For women, the Cima is designed with shaped seams and a tapered waist for a flattering fit.Whether you are warming up, cooling down, taking a walk or running errands, the Cima lets you do it in style.Fabric: 100% Polyester textured knit with brushed back.270 g/m2 (8 oz/yd2).CONTRAST: 100% Polyester brushed tricot knit pocket bags.LINING: 100% Polyester brushed tricot knit pocket bags. About this Tyndall Polyfleece Vest by TRIMARK - Womens:The Tyndall is a perfect complement to a long sleeve woven when the temperature starts to dip.Made with 100% polyester anti-pill microfleece, it features contrast binding around the armholes that matches the full center zipper.The Tyndall also includes design details like easy grip zipper pulls and a contrast hanger loop inside the neck, and the womens style has a dropped back hem, shaped seams and tapered waist for a more natural fit.Fabric 100% Polyester Anti-pill microfleece, 180 g/m2 (5.3 oz/linear yd). About this W - Kariba Knit Jacket:The Kariba Knit Jacket is the perfect piece for todays active lifestyle.Its retail-inspired, modern styling make it a strong go-to piece.Its useful sporty features include sleeve cuffs with thumb exits, interior media port with cord guide, articulated elbows and ergonomic sleeves.Wear it to the gym, office or anywhere in between.This piece will keep you dry and comfortable all day long.Fabric: 80% Cotton 20% Polyester jersey knit bonded to 93% Polyester 7% Elastane jersey knit, 480 g/m2 (14.2 oz/yd2) CONTRAST: 76% Cotton 19% Polyester 5% Elastane 1x1 rib knit inner collar, partial body hem and partial sleeve cuffs. About this M - Ozark Insulated Jacket:When the weather turns nastier, be ready with this fully seam-sealed jacket. The Ozark Insulated Jacket is constructed with ECHOHEAT thermal reflective technology that uses body heat to help keep you warm. Available in four distinctive color combinations. Laser not available on Black.Fabric: 100% Polyester mechanical stretch woven with waterproof, breathable membrane and water repellent finish. 125 g/m2 (3.7 oz/yd2). About this W - Pinehurst Roots73 Fleece Jacket:The Pinehurst Fleece Full Zip Jacket is made from cotton and polyester sueded washed fleece for extra durability. With a roomy jersey knit media pocket, this jacket will keep you warm during your nights camping out under the stars.Fabric: 80% Cotton 20% Polyester sueded washed fleece, 300 g/m2 (8.9 oz/yd2). 58% Cotton 42% Polyester sueded washed fleece, 300 g/m2 (8.9 oz/yd2) BLACK MIX. CONTRAST: 95% Cotton 5% Spandex 2x2 rib knit. 57% Cotton 38% Polyester 5% Spandex 2x2 rib knit BLACK MIX. About this M - Riverside Roots73 Fz Hoody:The Riverside Fleece Full Zip Hoody is perfect for your canoe or kayaking trips, or when you are simply lounging around the dock or boat. With a jersey knit hooded lining and media pocket, this hoody will keep you cozy in the riverside breeze.Fabric: 80% Cotton 20% Polyester sueded washed fleece, 300 g/m2 (8.9 oz/yd2). 58% Cotton 42% Polyester sueded washed fleece, 300 g/m2 (8.9 oz/yd2) BLACK MIX. CONTRAST: 95% Cotton 5% Spandex 2x2 rib knit. 57% Cotton 38% Polyester 5% Spandex 2x2 rib knit BLACK MIX. About this W - Mikumi Hybrid Softshell:Theres a lot to love about the Mikumi Hybrid three-layer hybrid softshell jacket.Along with its trendy retail look, its got unique features of reflective piping, thumb exits in the sleeves and a media exit port with cord guide.Offering lightweight comfort for the transitions between seasons, the Mikumi is waterproof and breathable with elasticized cuffs and an elastic drawcord at the hem.Fabric: OUTERSHELL: 100% Polyester jersey knit bonded to 100% polyester graphic pattern knit with waterproof (5000mm), breathable (500 g/m2) membrane and water repellent finish. 165 g/m2 (4.9 oz/yd2) CONTRAST: 60% Nylon 40% Polyester textured woven. About this W - CIMA KNIT JACKET:The Cima is a sporty lightweight style that features plenty of thoughtful details.Along with easy grip zipper pulls and thumb exits in the sleeve cuffs, the Cimas grey upper zipper placket offers a unique location for high-impact decoration.It also has an interior media exit port with cord guide, a dropped back hem, and eye-catching contrast zippers and stitching.For women, the Cima is designed with shaped seams and a tapered waist for a flattering fit.Whether you are warming up, cooling down, taking a walk or running errands, the Cima lets you do it in style.Fabric: 100% Polyester textured knit with brushed back.270 g/m2 (8 oz/yd2).CONTRAST: 100% Polyester brushed tricot knit pocket bags.LINING: 100% Polyester brushed tricot knit pocket bags. About this Core 365(R) MenS Motivate Unlined Lightweight Jacket:Lightweight unlined full-zip jacket made of 100% 240T polyester pongee, 2.3 oz./yd2/78gsm with water-resistant finish.Chin guard.Center front reverse coil autolock zipper with reflective toggle.Underarm vents.Lower front concealed zippered pockets with reflective toggles.Audio port access through inside lower left pocket.Elasticized cuffs.Adjustable shockcord at hem.Reflective piping at shoulder yoke and center back yoke. About this M - Kariba Knit Jacket:The Kariba Knit Jacket is the perfect piece for todays active lifestyle.Its retail-inspired, modern styling make it a strong go-to piece.Its useful sporty features include sleeve cuffs with thumb exits, interior media port with cord guide, articulated elbows and ergonomic sleeves.Wear it to the gym, office or anywhere in between.This piece will keep you dry and comfortable all day long.Fabric: 80% Cotton 20% Polyester jersey knit bonded to 93% Polyester 7% Elastane jersey knit, 480 g/m2 (14.2 oz/yd2) CONTRAST: 76% Cotton 19% Polyester 5% Elastane 1x1 rib knit inner collar, partial body hem and partial sleeve cuffs. About this M - Mikumi Hybrid Softshell:Theres a lot to love about the Mikumi Hybrid three-layer hybrid softshell jacket.Along with its trendy retail look, its got unique features of reflective piping, thumb exits in the sleeves and a media exit port with cord guide.Offering lightweight comfort for the transitions between seasons, the Mikumi is waterproof and breathable with elasticized cuffs and an elastic drawcord at the hem.Fabric: OUTERSHELL: 100% Polyester jersey knit bonded to 100% polyester graphic pattern knit with waterproof (5000mm), breathable (500 g/m2) membrane and water repellent finish. 165 g/m2 (4.9 oz/yd2) CONTRAST: 60% Nylon 40% Polyester textured woven. About this M - JAYA KNIT JACKET:Fashionable functionality makes this breathable, 100% micro polyester mélange knit jacket so impressive.Add in the bold color blocking, heat transfer graphic detail, sleeve cuffs with thumb exit, contrast stitching and contemporary modern fit and the Jaya is ready for just about any activity.Available in 3 heather colors, this jacket also features a wicking finish and moisture management to keep you dry and comfortable; when you are focused in those deep yoga stretches or on your daily run.Fabric: 100% Micro polyester melange knit with wicking finish.200 g/m2(5.9 oz/yd2).CONTRAST: 91% Micro polyester 9% Spandex interlock knit with wicking finish. About this W - JAYA KNIT JACKET:Fashionable functionality makes this breathable, 100% micro polyester mélange knit jacket so impressive.Add in the bold color blocking, heat transfer graphic detail, sleeve cuffs with thumb exit, contrast stitching and contemporary modern fit and the Jaya is ready for just about any activity.Available in 3 heather colors, this jacket also features a wicking finish and moisture management to keep you dry and comfortable; when you are focused in those deep yoga stretches or on your daily run.Fabric: 100% Micro polyester melange knit with wicking finish.200 g/m2(5.9 oz/yd2).CONTRAST: 91% Micro polyester 9% Spandex interlock knit with wicking finish. About this Mercer Insulated Vest by TRIMARK - Mens:Add an extra layer of warmth with the lightweight Mercer.Featuring 100% polyester faux down insulation, an interior storm flap with chin guard and water-repellent finish, the Mercer is designed for decoration with a high-visibility back-shoulder panel.Other great features include contrast binding on the hem and arm holes for mens.The womens style has a dropped back hem with shaped seams and a tapered waist for a more natural fit.With trendy retail styling, the Mercer is a fashion-forward look for any brand.Fabric: OUTERSHELL: 100% Polyester 290T woven with water resistant coating (600mm) and water repellent finish.60 g/m2 (1.8 oz/yd2).LINING: 100% Polyester 290T.INSULATION: 100% Polyester faux down fill total of body, sleeves and hood.393 g (13.9 oz) Mens size L.
About this Mercer Insulated Vest by TRIMARK - Womens:Add an extra layer of warmth with the lightweight Mercer.Featuring 100% polyester faux down insulation, an interior storm flap with chin guard and water-repellent finish, the Mercer is designed for decoration with a high-visibility back-shoulder panel.Other great features include contrast binding on the hem and arm holes for mens.The womens style has a dropped back hem with shaped seams and a tapered waist for a more natural fit.With trendy retail styling, the Mercer is a fashion-forward look for any brand.Fabric: OUTERSHELL: 100% Polyester 290T woven with water resistant coating (600mm) and water repellent finish.60 g/m2 (1.8 oz/yd2).LINING: 100% Polyester 290T.INSULATION: 100% Polyester faux down fill total of body, sleeves and hood. About this Norquay Insulated Jacket by TRIMARK - Mens:The Norquay is a stylish look for fall to winter.A combination of lightweight warmth and trendy retail styling, the Norquay provides protection from the elements with 100% polyester faux down insulation, an attached hood, interior storm flap with chin guard and water-repellent finish.It also features contrast binding on the cuffs, hem and hood opening for mens.The womens style has a dropped back hem with shaped seams and a tapered waist for a more natural fit.With its retail look and decoration-friendly back-shoulder panel, the Norquay will command attention for any brand.Fabric: OUTERSHELL: 100% Polyester 290T woven with water resistant coating (600mm) and water repellent finish.60 g/m2 (1.8 oz/yd2).LINING: 100% Polyester 290T.INSULATION: 100% Polyester faux down fill total of body, sleeves and hood.393 g (13.9 oz) Mens size L.
About this Norquay Insulated Jacket by TRIMARK - Womens:The Norquay is a stylish look for fall to winter.A combination of lightweight warmth and trendy retail styling, the Norquay provides protection from the elements with 100% polyester faux down insulation, an attached hood, interior storm flap with chin guard and water-repellent finish.It also features contrast binding on the cuffs, hem and hood opening for mens.The womens style has a dropped back hem with shaped seams and a tapered waist for a more natural fit.With its retail look and decoration-friendly back-shoulder panel, the Norquay will command attention for any brand.Fabric: OUTERSHELL: 100% Polyester 290T woven with water resistant coating (600mm) and water repellent finish.60 g/m2 (1.8 oz/yd2).LINING: 100% Polyester 290T.INSULATION: 100% Polyester faux down fill total of body, sleeves and hood. About this Arden Fleece Lined Jacket by TRIMARK - Mens:Relaxed comfort is the name of any game you want to enjoy outside when youre wearing the Arden Fleece Lined Jacket.The polyester outer surface is woven with a 1,000 mm water repellant coating.With thoughtful features like the interior zipper pocket and detachable hood, you might not need another jacket this fall.Fabric: 100% Polyester dobby woven with water resistant coating and water repellent finish.120 g/m2 (3.5 oz/yd2). About this Arden Fleece Lined Jacket by TRIMARK - Womens:Relaxed comfort is the name of any game you want to enjoy outside when youre wearing the Arden Fleece Lined Jacket.The polyester outer surface is woven with a 1,000 mm water repellant coating.With thoughtful features like the interior zipper pocket and detachable hood, you might not need another jacket this fall.Fabric: 100% Polyester dobby woven with water resistant coating and water repellent finish.120 g/m2 (3.5 oz/yd2). Thank you Alexia! All our products are made with high precision. We aim for perfection to be shipped to our customers. Mother nature will not stop anyone from exploring and seizing the day with our collection. Don’t miss out on our featured items. Our customer service team is always ready to help you complete your order. Offers a perfect combination of style, comfort and performance. From the contoured cuffs and dropped back hem, to the articulated elbows and ergonomic sleeves, it provides a superior fit for all seasons, sports and exercise activities. The Verdis three-layer construction includes a waterproof breathable membrane for added comfort in wet weather, while the reflective Elevate logo on the rear right hip adds a stylish touch. The outer shell features a 100% Polyester heather knit and is 100% Polyester woven with waterproof (8000mm), breathable (600g,m2) membrane and water repellent finish. Ready? 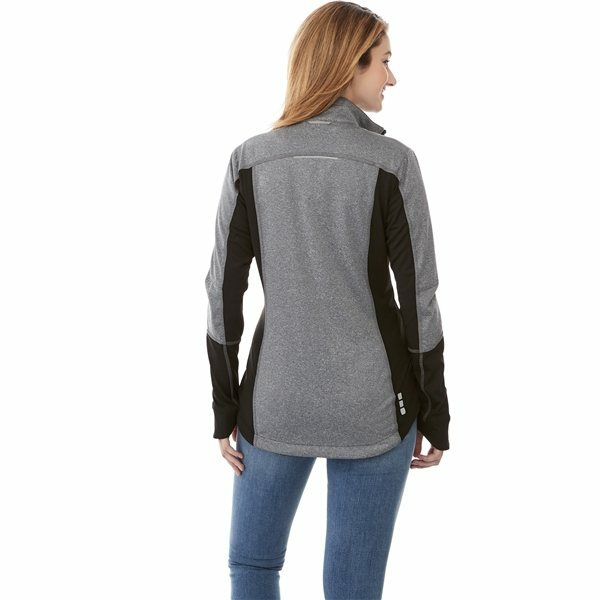 Order your Veri Hybrid Softshell Jacket by TRIMARK - Women’s now! We’re happy to hear you’re happy with the quality, Gabriella, Owen, and Ryland. We agree that our imprinting is outstanding! For each product, we direct our careful attention on the cleanliness of the logo and text. Our team will always work along with the customer if anything goes wrong. You come first! We wouldn’t ever want to disappoint our customers with anything less than our high quality apparel and custom imprinting. 100% taslon nylon shell w/microfleece lining & lightweight polyfill insulation. Outside zip pockets, inside zip security pocket. Don’t get cold feet shoulders, shop the Devon & Jones Three-Season Classic Jacket now! This jacket will definitely suit anyone’s preference and fit for any weather need. Our customer service team is filled with people who are happy to help you. Has a gently contoured silhouette and clean lines, with no added chest pocket. Heavyweight fleece lining for extra warmth. Poly-filled sleeves with polyester lining. Slash zippered pockets, interior zippered pocket. Open hem with drawcord and toggles for adjustability. Available in Steel Grey, Khaki, Maroon, True Black, True Hunter, True Navy, True Red, True Royal. With a variety of colors for an option, the color you seek is within our selection. The Port Authority Ladies Challenger Jacket will be a popular hit at your next event. Let us help you plan it today. Order online or call us at 877-368-5678 to help better serve you. In our selection of jackets and outerwear, we have 300+ different styles that will fit your customer’s needs. Apparel is a top product for every customer, and an upper hand for the company. Don’t be fooled, on AnyPromo our products are of high-quality, and specially priced for our customers. Join the hottest trend and warm up your customers! You can find our top Jackets and Outerwear here! Our personalized jackets and outerwear are designed for performance and comfort to keep outdoor enthusiasts warm while they keep going. Every fleece, windbreaker and blanket lined jacket is specially priced and professionally imprinted to vividly promote your brand. Let’s make marketing make sense! Search our site for a wide selection of promotional jackets and outerwear. Check out even more cool jacket apparel on sale now. Take a peek at our hot selection of performance inspired promotional outerwear. We’re ready to help expedite your order, so give us a call! Warm up to these must-have promotional gifts! Our selection of jackets & outerwear are all high quality; you’ll have no problem selecting which item you’re looking for. Our website is fast and easy to use, you’ll have no problem if ordering in a rush either. These are the wardrobe essentials everyone will love to have. We feature well known brands like American Apparel, Dickies, North End, Port Authority, and Trimark. From lightweight rain to blizzard storms, our items are ready for any situation.